Hawaiʻi County police have charged a 45-year-old Puna man in connection with a domestic dispute in Pāhoa Sunday night (December 2). At 5:45 p.m. Tuesday (December 4), after conferring with prosecutors, detectives from the Area I Criminal Investigations Section charged Peter Lopes of Pāhoa with first-degree burglary, second-degree assault and second-degree terroristic threatening. His bail was set at $37,000. Prosecutors declined to charge Lopes at this time with arson or promotion of a detrimental drug pending additional follow-up investigation. Sunday at about 7:59 p.m., police and Hawaiʻi Fire Department personnel responded to a Hawaiian Beaches home after receiving a report of a structure fire. They discovered a house fully engulfed in flames. Police learned that the occupants, a 41-year-old Pāhoa woman and Lopes, had exited the home prior to the fire and were uninjured. Police investigation revealed that Lopes had allegedly threatened to set fire to the house. 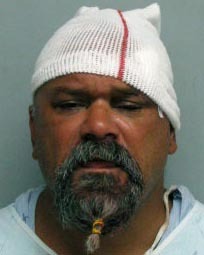 Police found Lopes at a nearby home with a head injury unrelated to the structure fire. He was taken to Hilo Medical Center for treatment. Lopes was arrested Monday (December 3) after he was discharged from the hospital. Police continue to ask that anyone with information on this case or who may have witnessed this incident contact Detective Norbert Serrao at 961-2383 or nserrao@co.hawaii.hi.us.